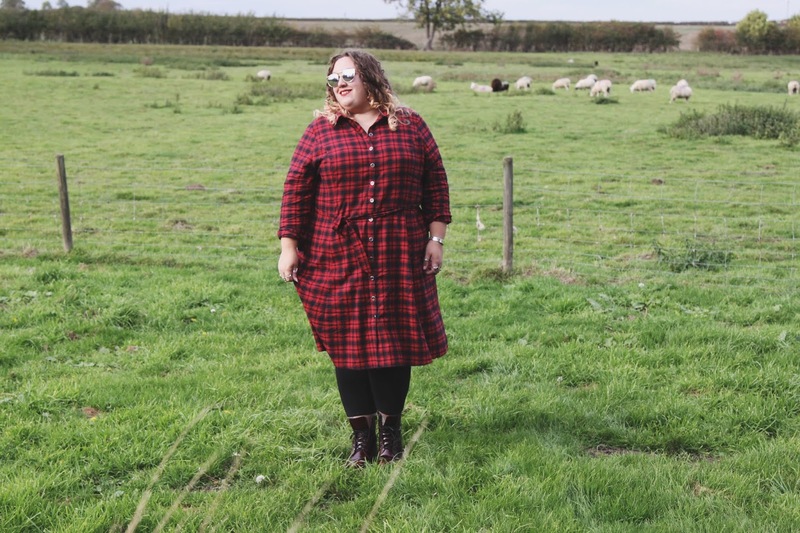 Could there be a more perfect spot to photograph a checked dress than in front of a lovely field of sheep? 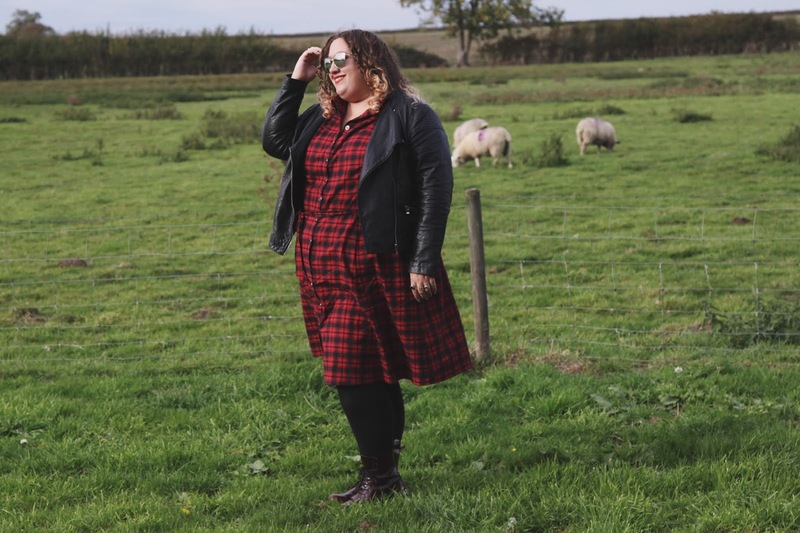 You can never go wrong with a plaid or tartan print, especially not in autumn. It makes me thinks of Alice in Chains and Pearl Jam and grunge loving men with long hair, all things I'm rather fond of! 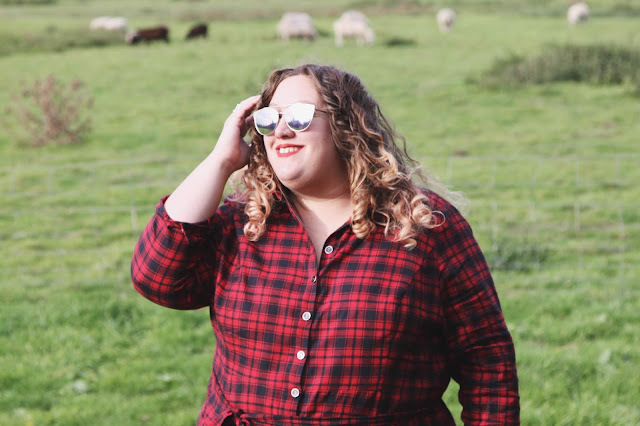 100% cotton isn't something you hear a lot in plus sizes, but it is something you can get yours hand on at Navabi. When you're used to polyester and mixed fabrics, 100% cotton feels like an utter delight to wear. It's so soft and comfortable. True luxury is something you can actually buy your plus size body at Navabi and I'm forever grateful they exist. 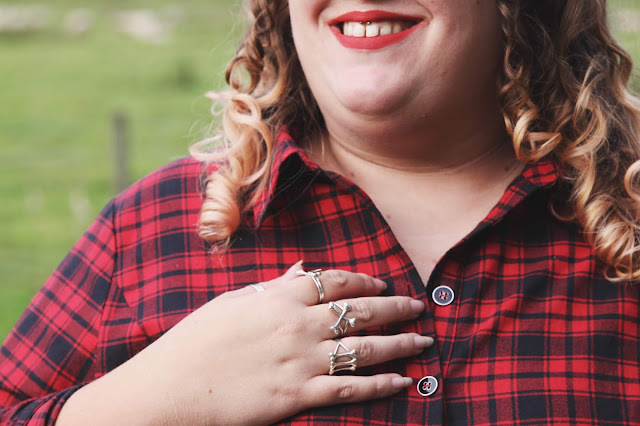 All the rings you can see in this photo are of course from my faves, Bloody Mary Metal. I can never resist sterling silver! The buttons on the dress feel really sturdy and solid, always reassuring with a shirt dress. It doesn't gape on my bust at all, and I got the dress in my usual size. It's wonderful and warm too. Good and cosy for the colder weather. The sleeves are just about long enough for my long arms, but I'm not a big fan of cuffs so I undid them and rolled them up instead. It hits me at just below knee level, I'm 5ft 11 so on someone of more average height it would be more of a midi length than it is on me. My boots are one of my favourite pairs of shoes. 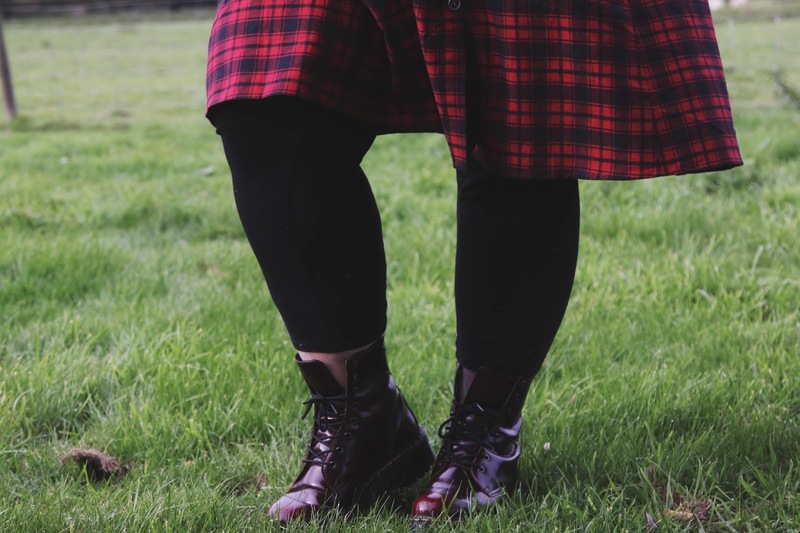 They are part of the vegan Dr Martens range, and are Jadon II in cherry red cambridge brush. They have a chunky platform which does weigh a fair bit, so it's one to keep in mind if you plan on wearing them all day. I like them for a bit of extra height at gigs! I wish Dr Martens would expand their vegan line, especially in the size 9+ range. 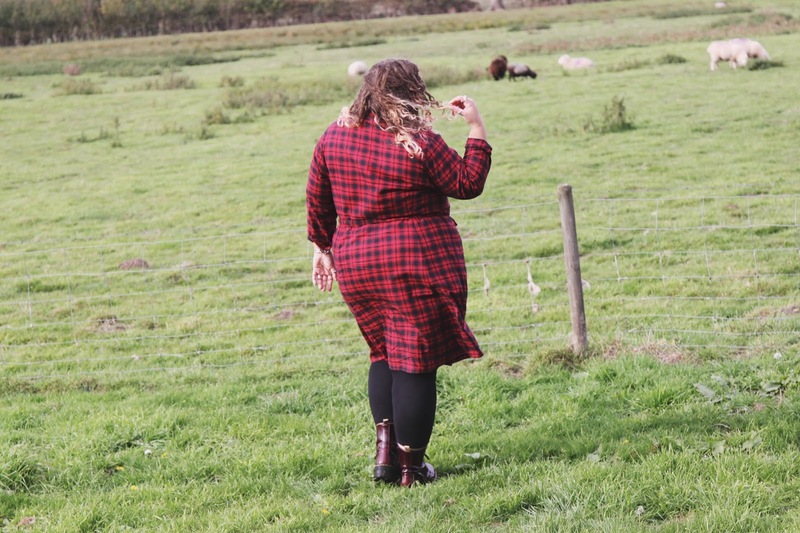 The women's range is up to a size 9 only and gets all the best colours, I just want a pair of size 10 vegan boots in purple! If you want to get your mitts on this dress, or anything else from Navabi, you can use the code KITTY15 for a discount! It's not an affiliate code or anything like that, but it will get you pennies off your purchase. Yay! Navabi are a company who I cannot adore enough. They do so so much for the plus size community and constantly fight for real inclusiveness, and real change in the industry. They are the change they want to see, and that's so amazing to see. *denotes an item gifted to me. I was under no obligation to review or post it, but I wanted to! I think this may be the year I splash out on a pair of DMs, particularly if we're going to have another winter like last one. 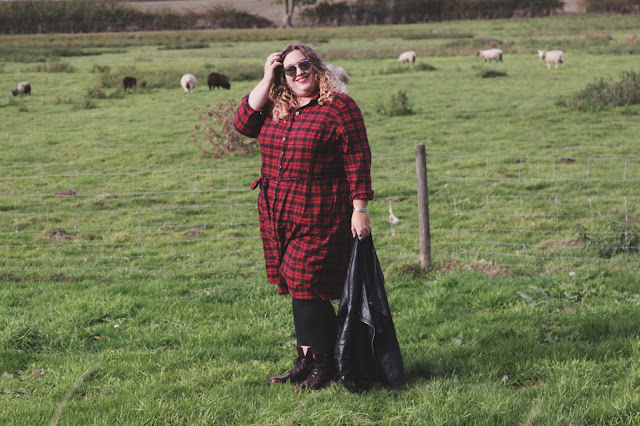 I have a really heavy tread so wear through shoes quite quickly - I think something a bit more hard-wearing, but also timeless, is the way to go!